It is an eye disease caused by the separation of the inner retina from its outermost layer, the pigment epithelium. Macular degeneration affects central vision seriously but peripheral vision remains, and therefore it never produces total blindness. 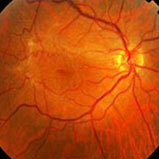 It is a metabolic disease affecting the retinal vessels, causing blood or fluid leakage. It is one of the leading causes of blindness worldwide. Epiretinal membrane is produced by the growth of a tissue in the macular area of the retina that causes decreased visual acuity and distortion of images. The macular hole is a break in the retina at the level of the macula. 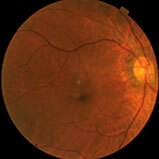 The patient usually reports a decrease in central vision and metamorphopsias or distortion of images. The vitreous is a collagen gel that fills the eye socket and has anchoring zones that allow it to be attached to the retina. There are two types of vascular occlusions, arterial and venous. The myopia occurs subsequent elongation of the eyeball seems to be genetically conditioned and influenced by environmental factors. 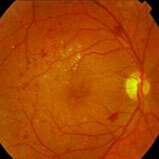 Retinitis pigmentosa is an inherited disease that affects the light photoreceptor cells in the retina. The age of onset varies between 25 and 40 years, although there are cases diagnosed before age 20 or after 50 years. Central serous choroiditis is a detachment of the neurosensory retina of the macula.